Susan Myers lives in the Spartanburg area where she resides with her husband, two boys, dog, and chickens. As Head Librarian for thirteen years, she leads the staff at Spartanburg High School. She likes technology because (in her words) only chickens would be able to read her notes if she used her own suspect handwriting. 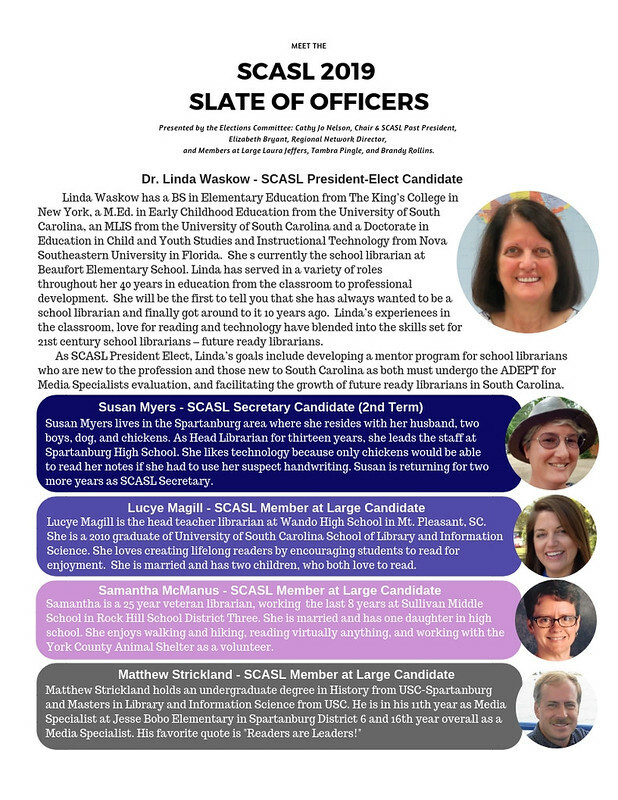 Susan is returning for two more years as SCASL Secretary. Lucye Magill is the head teacher librarian at Wando High School in Mt. Pleasant, SC. She is a 2010 graduate of University of South Carolina School of Library and Information Science. She loves creating lifelong readers by encouraging students to read for enjoyment. She is married and has two children, who both love to read. Samantha is a 25 year veteran librarian, working the last 8 years at Sullivan Middle School in Rock Hill School District Three. She is married and has one daughter in high school. She enjoys walking and hiking, reading virtually anything, and working with the York County Animal Shelter as a volunteer. Matthew Strickland holds an undergraduate degree in History from USC-Spartanburg and Masters in Library and Information Science from USC. He is in his 11th year as Media Specialist at Jesse Bobo Elementary in Spartanburg District 6 and 16th year overall as a Media Specialist. His favorite quote is "Readers are Leaders!"